Make Sure We Have Enough Plates to Share! The Free Harvest Supper was conceived and created when a group of passionate farmers, foodies, and community advocates were discussing how our neighbors should be able to access the amazing abundance of food in our happy valley. Each August we come together to share that bountiful harvest with our community. 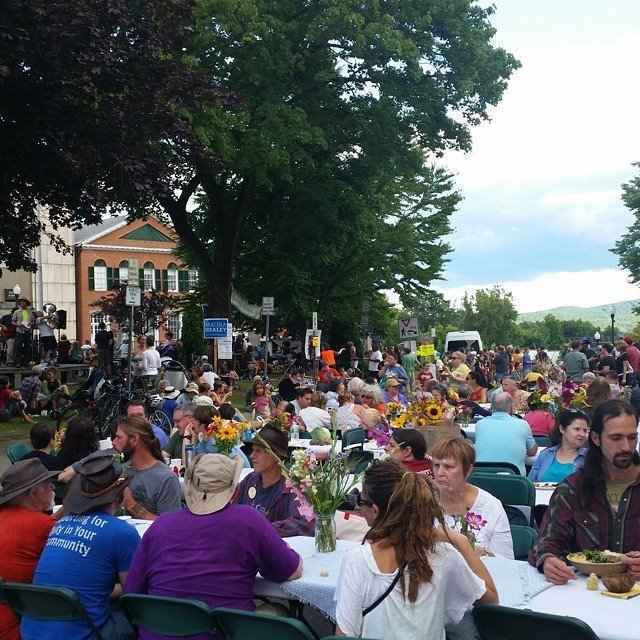 Farmers, local producers of goods, and talented chefs all donate their time and products to create an amazing meal that is served on the town common in Greenfield Massachusetts. While the foodstuffs are free the ancillary costs are not. Each year our meal grows and we serve more of our neighbors. Funding for the meal consists of the following: postage, photocopying, tent, table, and chair rentals, equipment and truck rentals, serving supplies, fuel, and many more. It all adds up pretty quick. Your support can make a difference - donate today!